TGIA HAS A PODCAST! WOOHOO! 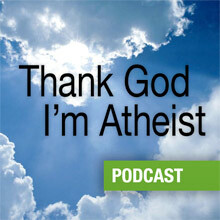 So, if you want to listen, you can stream it from our web site, or scoot on over to here, or (recommended) go to iTunes and type “Thank God I’m Atheist” into the search bar. Then click “subscribe”, and sounds of joy and jubilation will spring forth from your computer, and choirs of angels will sing, and confetti and balloons will drop from your ceiling, and the lion shall lie down with the lamb, and all will be well in the Universe. Thus sayeth the Lord. And by Lord, I mean me. And I could be lying…. How about us who doesn’t want Apple’s sofware on our computer? Aren’t there an option for us? I have been meaning to leave you a comment for a long time, but life gets in the way. I have been to the podcast site on iTunes with the intention of rating you 5 starts. Unfortunately, I need to have an Apple ID to do this. As much as I love you two, I’m not giving my credit card info to Apple. Anywho, I wanted to know your opinion on why there are so many fundamental christians and so much gun violence in the US. Do you think these things are related? I am an ex-patriot living in Europe for 10 years now and there is no possible way I could move back to the US. You guys keep up the groovy work! Helped leep me sane when I was going through the change… to atheism!! while livingi na country where it is a capital offense.